We’ve had a long relationship with business card readers here at Business Mobile, as journalists we get a lot of business cards, and we’d love to be able to liberate the data from them, but unfortunately it never happens, instead they just sit in boxes on our desks, and occasionally we have a rummage through, but most end up in the bin when it comes to the end of year desk clear out. We’ve tried card scanners in the past but most get put back in the box after a few goes and never see daylight again – the IRISCardmini was the last device we reviewed and it’s remained in a draw for the last three years. Well it is year end and we decided enough was enough and that there was bound to be an app for that, so we went searching. The WorldCard Mobile iPhone app has just been updated so we decided to take a look at it. 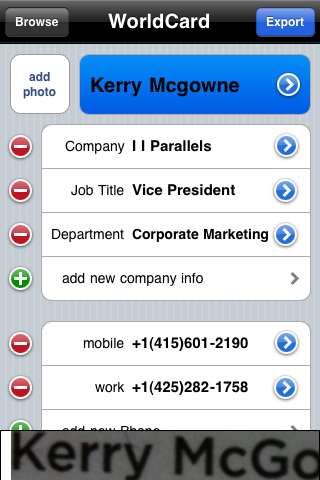 New features include automatic camera shake reduction, email signature capture, improved accuracy, plus there’s some further integration with WorldCard Contacts (sold separately) that allow you to make a call, send a text message or email, browse to the company website directly from the business cards image. The app comes in two versions a full app for the iPhone 3gs and 4, a lite version to test the app, and we looked at the full app and the lite app, on a 3G and a 3Gs. Click on the app and you’re brought to an opening page with a main option of camera, three other options of Photos, Signature, Card Holder and then various settings and help options. When you click on Camera it opens up the card reader, and gives you two choices, you can either take a pic, or you can select the hand symbol which activates the camera shake reduction. With the shake reduction the app uses the cameras internal sensors to take a picture only when the camera detects it’s not shaking. When we first tried this on the train on the way back from a meeting we thought the app had frozen, it was only when the train pulled into a stop that the camera clicked that we realised what the camera shake reduction was doing. Once you’ve taken the picture you can then get on to the job of recognizing the card’s details. Click on the Recognition button and away it goes, and within a second you’re presented with a screen with the cards details magically digitised into the right categories. We tried the app out on a selection of about 20 cards from simple black on white text, to white text out of a red background, and various different unusual layouts. While it didn’t always recognise every data category – it sometimes would miss out the email address or the snail mail address – when it did recognise a name, address etc, it was ALWAYS 100% right in its translation, we never had to edit a bit of digitised text in all the cards we looked at. However if you did get a problem a nice feature was the ability to look at the scanned text, and compare it to the digitised version, and to do that while editing the results. 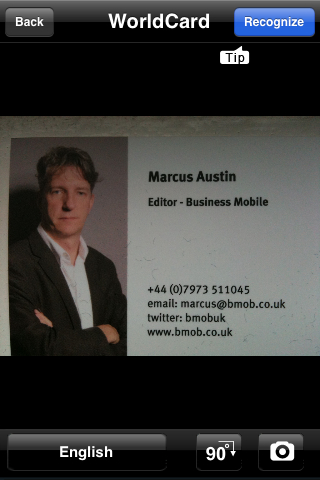 Other features allow you to save a picture of a person with the business card, although we’d have to admit we’re probably a little too English and embarrassed to use this feature much. There’s also the ability to set the system to recognise cards in other languages including Dutch, French, German, Italian, Portuguese and Spanish. You can also add notes to the card, add other addresses and more info, and you can sort the cards into your own groups such as work, personal, or a business name if you have more than one contact in a business. One other function that we thought was novel, was the signature function – but we doubted that we’d use it much – with this function you have the ability to associate the card with some text that you’ve cut and pasted on your iPhone, like an email signature etc. However one feature that we did use was the ability to export the data directly into the Contacts on your iPhone, it defaults to saving the cards in the apps own internal card holder, you need to select this in the settings to get it to work. Aside from the slight blip with the shake reduction – we’d call it a shake indicator feature rather than a shake reduction feature – the app achieved startling results. We’d recommend this app to anyone with an iPhone 3Gs and iPhone 4 phone (it will work on earlier devices but the results are very poor and recognition is slow). If you want to test the app for yourself there’s a free lite version that gives you most of the main apps functionality but is limited to saving just a few cards, you can scan as many as you want to test the recognition system, and we recommend that you do, as the app’s recognition systems has to be seen to be believed..
We’re so happy with the app that it’s now our app of choice for Business card scanning and we think it’s the new standard that we’ll use for judging other character recognition systems against.